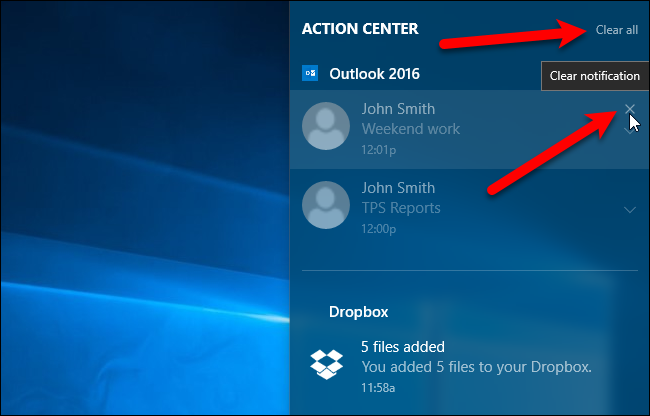 Notifications in Windows 10 are integrated into the Action Center. The white Action Center icon indicates that you have new notifications, and the number badge shows you how many. If you don’t want to see that badge, it’s easy to disable. To disable the number badge, right-click the Action Center icon and select “Don’t show number of new notifications” on the popup menu. The number badge on the Action Center icon disappears. The icon still becomes white when there are new notifications and you can still hover your mouse over the icon to find out how many there are. You can always click the icon to open the Action Center, where you can view new and past notifications. Notifications will usually remain until you clear them, but some notifications may get removed automatically over time or if you shut down the application or service that created them. And if you ever want to turn the number badge back on, just right-click the Action Center icon and choose the “Show number of new notifications” option.